Emirates Airlines does provide connections to selected flydubai destinations. 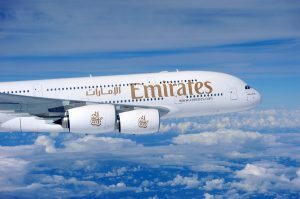 This allows passengers travelling with Emirates to connect to flydubai destinations not currently served by Emirates. Passengers for Aleppo, Alexandria, Baku and Djibouti can connect through Dubai Airport to or from an Emirates flight. Passengers will have a single booking and your baggage will be checked through at your point of boarding at Dubai Airport. To book this service please contact your local Emirates office. There are 5 flight transfer desks located within Terminal 1 of Dubai Airport to help passengers transfer to their connecting flight at Dubai Airport. These desks are clearly labelled within the terminal building and they are as follows. Dubai Airport Transfer Desk E is situated on the lower level for passengers travelling from Terminal 2 at Dubai Airport. There are 3 flight transfer desks within Dubai Airports Emirates Terminal 3 and they are alphabetically labelled as G, H & J. If you have purchased a ticket with Emirates and part of your journey involves a connecting flight with flydubai at Dubai Airport then please continue reading below as there is some important information you need to know. As your booking is with Emirates, you will need to contact Emirates to make any amendments to your travel plans. Please contact your local Emirates office. Regardless of whether you are checking in with Emirates or flydubai, passengers will need to hold a valid Emirates e-ticket and all other valid travel documents. If you are travelling on an Emirates ticket the Emirates baggage policy applies to your entire journey. So if you bring more baggage than the policy allows you will be required to pay the relevant excess baggage charge to either Emirates or flydubai depending on which the originating carrier is. When you check-in, your baggage will be tagged for your final destination, this means that you will not need to worry about collecting and transferring your luggage at Dubai Airport when transferring to your connecting flight. When your journey starts with Emirates at the majrity of airports worldwide, you will be given the boarding pass for your entire journey. However, when your journey starts with flydubai or at all other airports you will only be given the boarding pass for your journey to Dubai International Airport. and then on arrival in Dubai, Emirates will then issue you with another boarding pass for your onward flight upon arrival at Dubai Airport. At Dubai International Airport, Emirates operates exclusively from Terminal 3 and flydubai operates from Terminal 2. If you arrive on an Emirates flight you will need to head to the Central Transfer desk in Terminal 3 (also known as Transfer desk ‘K’) and if you arrive on a flydubai flight you will need to head to the Transfer desk in Terminal 2. At either of these desks you will be given a boarding pass for your onward journey (if you were not given one when you checked in at the start of your journey). You will then need to continue through security as normal to board a bus for the relevant terminal before heading to the departure gate for your connecting flight at Dubai Airport.